Beth, Steve, Eli and Sage are known as some of the most intrepid and incredible expedition paddlers at the Outward Bound School in Maine. They also happen to be Instructors. The past summer, they were looking for a challenge. 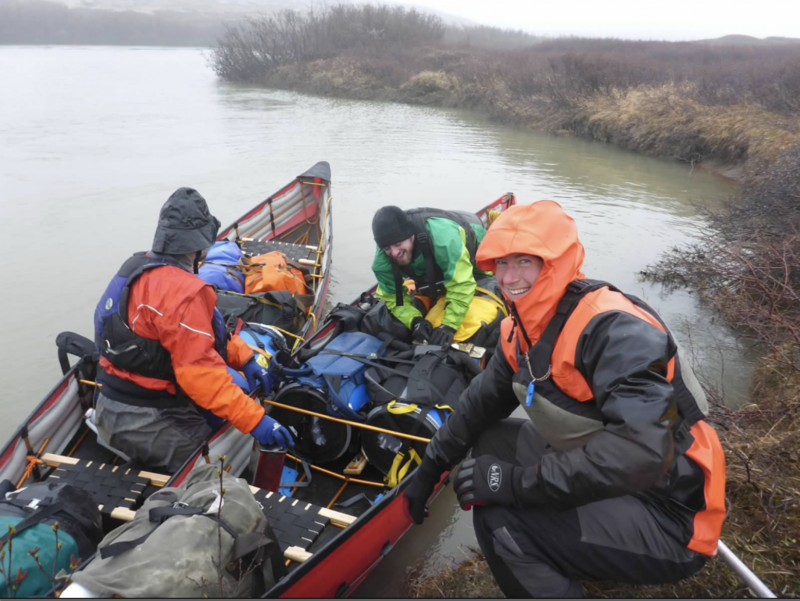 They set out on a 970 km journey over 46 days traversing the Ungava Peninsula in Canada by canoe. You can see their route here. They pushed through icebergs on the Hudson Bay, traveled upriver to the height of land, and followed a network of lakes and rivers into the Inuit village of Kangirsuk. “I wanted to do something that would challenge me in the same way or more as I try to challenge my students,” Beth said. Beth is a long-time Outward Bound Instructor of paddling expeditions in Maine, where students venture up to three weeks traveling by canoe through rivers and lakes lined with dense forest. 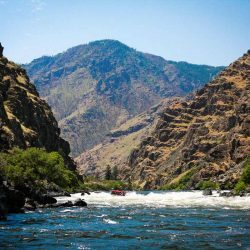 Crews bake bread in the coals of the campfire, spot moose along the wooded banks and navigate increasingly demanding whitewater rapids. In recent years, Beth has run the Florida Keys to Brazil Leadership Semester expedition, paddling through remote jungle rivers. Working with Outward Bound Brazil in the Amazon was about ‘going into a lot more unknowns’ which Beth says readied her to choose a remote Canadian journey as her next challenge. Sometimes the greatest part of an adventure isn’t where you go, it’s how. The team agreed to complete their expedition without using single-use plastic. A huge amount of plastic waste ends up in our land and oceans. 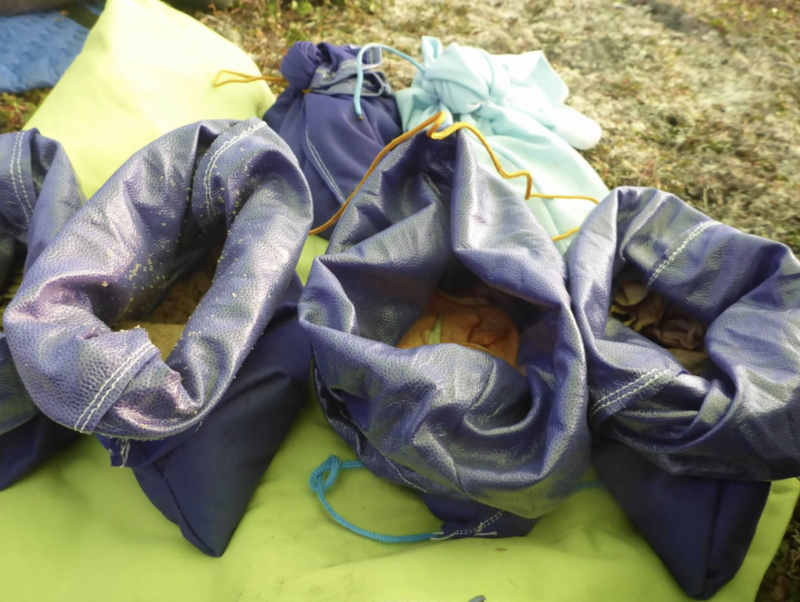 Understanding that our wilderness and home environments are ecologically interconnected, Beth noticed how ‘Leave No Trace’ in a wilderness setting sometimes results in pollution and waste in other environments. So Beth created an original design and sewed 200 reusable fabric food bags to use on their 46-day journey. 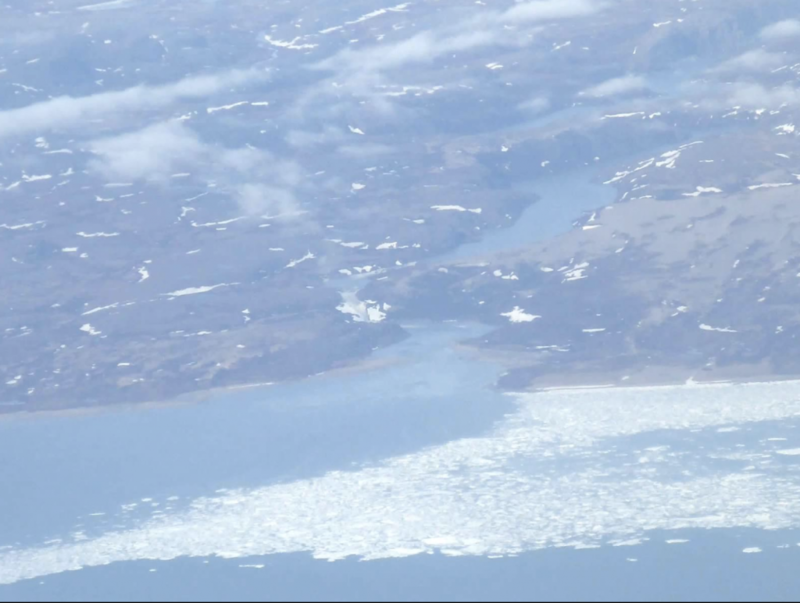 Flying into their starting point, the Canadian village of Umiujaq, the crew looked down on the inland lakes they would be paddling to see that they were…frozen. 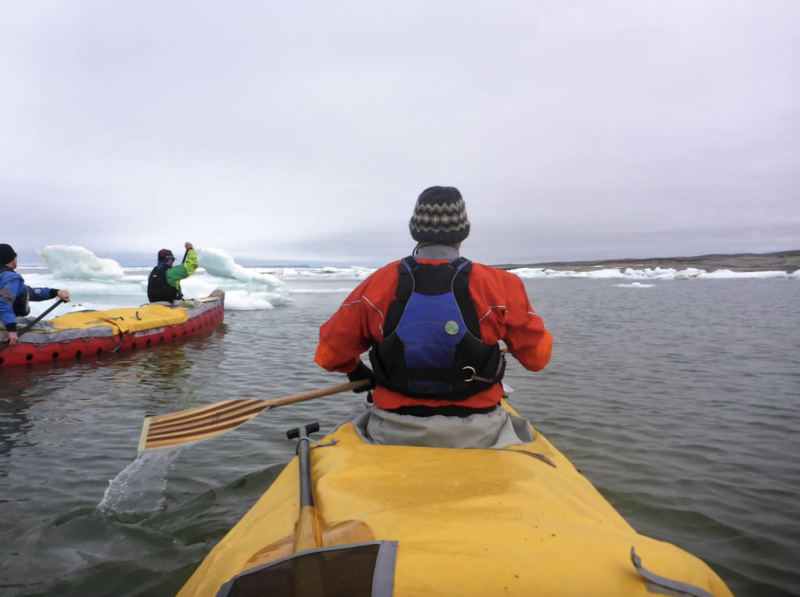 The ice had gone out on the Hudson Bay three weeks late; by the time they began paddling, everything was melting and the rivers were flooded into the trees with giant waterfalls. Traveling upriver in the Richard watershed, the water was painfully cold and the weather stormy. The route demanded that the team carry their canoes and gear up and over a mountain range for five days. The food barrels were so heavy it required two people to pick them up, and some nights the team just collapsed from exhaustion. The crew was immediately confronted with the intensity of all they were taking on. A view through the airplane window of Nastapoca Falls, 40km north of Umiuaq on Hudson Bay, where we would soon be paddling. This is also a great view of the ice on the bay. Photo by Beth Jackson. The challenges gave way to the thrills of unscouted whitewater; of catching and filleting plentiful brook and lake trout; following caribou tracks on their migrations around the most daunting rapids; circumventing a snow field; and picking cranberries. “On the morning of day 46, August 19th, 2018 when we landed on the beach in Kangirsuk, Nunavik, Quebec, you could see it in our eyes. Smiles, tiredness, relief, excitement, hunger, bittersweet. We had sun and wind-burnt faces, bags under our eyes, unkempt beards, mustaches growing past upper lips, and worn hands. Upon closer inspection one could see layers of dirt caked on once brightly colored dry suits, matted hair hidden under layers of hats, patches on boats, dead mosquitoes and black flies caked in every nook and cranny, and fresh baked potato flake and flour biscuits in our bowls. We had made it! 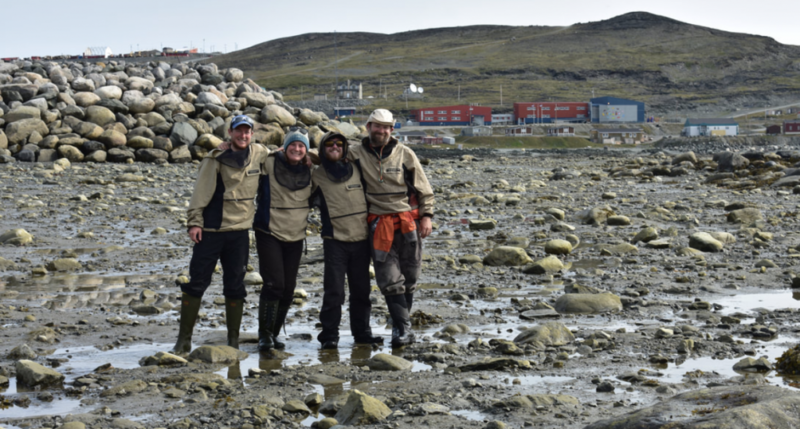 Our feet finally planted on the low tide beach in the Inuit community of Kangirsuk! The reusable plastic bags Beth created were also a huge success. At the expedition’s end, she turned them inside out and threw them in a washing machine—and are now ready for their next adventure. 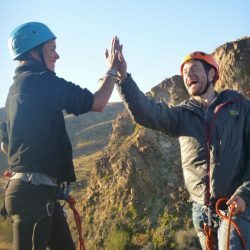 Nora Spicer has instructed backpacking and canoeing courses at the Hurricane Island Outward Bound School for five years. 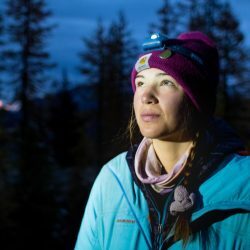 She has an MA in Environmental History from Harvard University and aims to bridge wilderness living and academic study through outdoor education. She is currently developing curriculum for an expedition-based semester program traversing US-Mexico borders by human-powered travel, and is traveling for research on Borderlands education. Great to hear the instructors who did the Canadian paddle reaction to the question , “So how was it”? Many a student has had to face that daunting question from family and friends. I wished I had better prepared some students for this question. The transition from expedition to “normal” life has been a long studied as a challenge for expeditionary learners . I suspect empathy will be “the saving grace” and these instructions seem to be able to provide plenty! BRAVO HIOBS!